Touched by the marks of time, this end Table is a rugged homage to classic farmhouse design. Made from roughhewn planks that are harvested from stocks of reclaimed wood and new pine, this table features natural knot and grain patterns that are sealed to perfection with a rich Smoky Taupe finish. Its spacious top provides ample of space for keeping remotes, magazines, and a cup of coffee within arms reach, while the open bottom shelf offers additional space to stack books and display special objects. 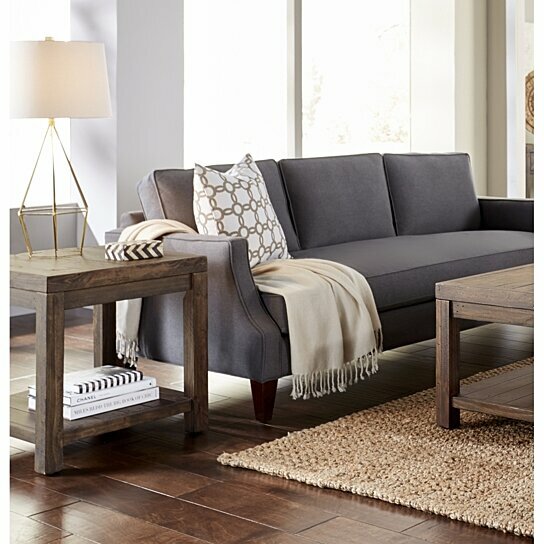 Add this end table next to your sofa and transform your living room into a rustic utilitarian aesthetic. Note: Other featured items in image except this end table are sold separately. The table features plank style top & shelf. Made from reclaimed wood and pine wood, this table will ensure long term utilization. The top and the lower shelf provides ample of storage and display space.